It’s been 11 years since we started CatSynth on a bit of a lark, and since then it has grown into something that we treasure, and quite seriously. But not too seriously. As always, we mark the annual milestone with a few stats. Comments and interaction on the blog has continued to decline (from an average of 4.7 to 4.47 comments per post). This is not surprising as interaction has largely moved to social media platforms. Our most visited post this last year was our Sad Farewell to Luna, both on the blog itself and on social media. This, too, is not surprising, and we continue to be very grateful for the outpouring of emotional support we have received. Other individual posts that were widely read and shared including our explainer on Lake Oroville, our review of James Chance and the Contortions in San Francisco, and of course our annual NAMM coverage. Every year we share the photo that started it all on July 19, 2006. It featured Luna in the beanbag chair along with a Novation keyboard. We feel its still appropriate for this day. We continue to grieve for Luna, but we also welcome Sam Sam who we hope with be with us and featured on these pages for years to come. Quietly, and without even really noticing, we reached our 3000th post yesterday! This one is in fact 3001. Nonetheless, it does feel like an achievement worth noting. A CZ 3000 feels like an appropriate image for today. As for us, we’re marking the 3000th post with a bit of needed relaxation. 1088 Cat-and-synth pics, videos, etc. In some ways, the blog activity has declined a bit since it’s height in the early 2010s. Much of the activity has moved over to Facebook, Twitter, and Instagram. And more recently, we are looking to the future via our mobile apps – there is much more coming there in the not-too-distant future. Additionally, I find myself balancing time spent writing blog articles with an increasingly busy schedule of musical performances and such. All good things in their own way. We are a bit late to celebrate this year due to some major personal and medical priorities on my part (all of which are going well, but also beyond the scope of this forum). It isn’t the first time our blog anniversary has gotten caught up in other things. Last year we missed the 9th anniversary entirely as we coped with Luna’s cancer diagnosis. And our first anniversary came amidst a major downtime for the site that took a week or so to fix. As always, here is the photo of Luna that started it all on July 19, 2006. Luna hasn’t aged all that much, retaining her youthful appearance. And that beanbag chair is still a favorite of hers. It’s where she hangs out in the studio, and over the years we have taken major photos of her with it. The studio has certainly gotten more crowded over time. 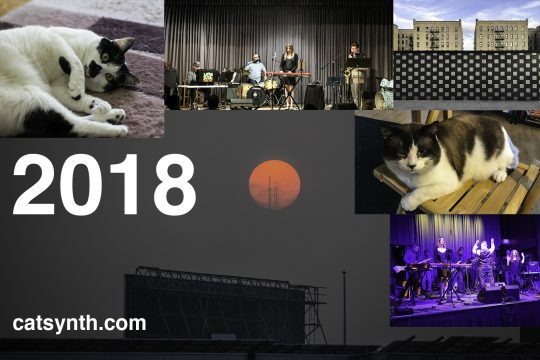 Please join us in celebrating 10 years of CatSynth, and looking forward to many more! Well, our eighth blog anniversary occurred this weekend. So today we celebrate that milestone as we do every year, with some statistics and a look backs. First, as always, the photo of Luna that launched it all on July 19, 2006. We are always happy to receive visitors from all over the world, and we do. Not surprising, the largest English-speaking countries are on the list (I include India), but also a strong presence in countries of Western Europe, especially Germany and France. Beyond India, several countries an Asia were well represented, especially Japan and South Korea. Notably, China had only 6 visitors this year, perhaps we have been blocked? Our top country in the Middle East was Iran, in Africa it was South Africa, and in South America it was Brazil. Our top ten cities were San Francisco, New York, London, Zurich, Los Angeles, Oakland, Sydney, Melbourne, and Chicago. Our top post from this past year was Our review of new modules from Make Noise. Indeed, we saw the highest overall engagement on our NAMM coverage. Our Facebook channel has become particularly strong on its own, often with distinct posts and readers from the blog. As for the blog itself, my own activity has gone down quite a bit this year, due to a variety of work and personal issues. In particular, I’d like to get back to more of our interest posts, including more music and art reviews, “Fun with Highways”, etc. And of course more cats and synths. And finally, thanks to everyone who has stuck with us through any or all of our channels. You are what makes this such a rewarding experience! Today we mark seven years since CatSynth first went online! Here was the photo of Luna from that first post on July 19, 2006. As we do every yeah, we celebrate this occasion with some stats. Our top day for visitors was January 26, 2013. This was during NAMM. The greatest number of visitors came from the United States, followed by the United Kingdom, Canada, and Germany. The top cities are San Francisco and New York. The top city outside the U.S. is London. iOS and Android are among the top five platforms used by our visitors, surpassing Linux. It’s gratifying to see a mixture of “cat-and-synth” posts and art/music reviews in this list. It supports my belief that mixing all the different topics together into one stream is worthwhile. I particularly enjoy our many cat enthusiasts commenting on the music reviews or highway posts. We hope to continue this project for a long time, and hope it continues to be a valuable and worthwhile resource. And a big thank you to all our readers and fans! You make this a joy to work on. Today marks our 6th anniversary! It’s amazing to think that we have been going on with this for 6 years. The past year has been a good one, in terms of quality of the post and engagement with readers here on the blog as well as via Facebook and Twitter, and we’re looking forward to an even better year ahead. And we are celebrating as we always do, with statistics. 258 reviews of art, music and technology. 621 catsynth pics and videos. The non-anglophone country that sent the most visitors to CatSynth is Germany. And finally, the posts most “liked” by Facebook users. It is quite interesting how the set of posts receiving the most blog comments and those receiving the most Facebook likes are completely disjoint. The former tends towards Wordless Wednesday and Luna, while the latter tends towards cat-and-synth pics and art/music reviews. Certainly something to reflect on as we move forward into this next year.